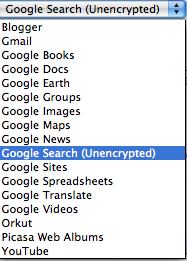 Google’s transparency tool provides information about traffic to Google services around the world. Each graph shows historic traffic patterns for a given country/region and service. In this screen shot you can see how the free flow of information ended twice in Libya within the last seventy two hours. Searchers can select a country/region and then choose a service to view each respective graph. Graphs are updated as data are collected, normalized, and scaled in units of 0 to 100. By showing outages, Google’s Transparency Report tool visualizes disruptions in the free flow of information, whether it’s a government blocking information or a cable being cut. Visit http://www.google.com/transparencyreport/traffic/ to check the status of information flow from within a particular country to any of these Google properties. 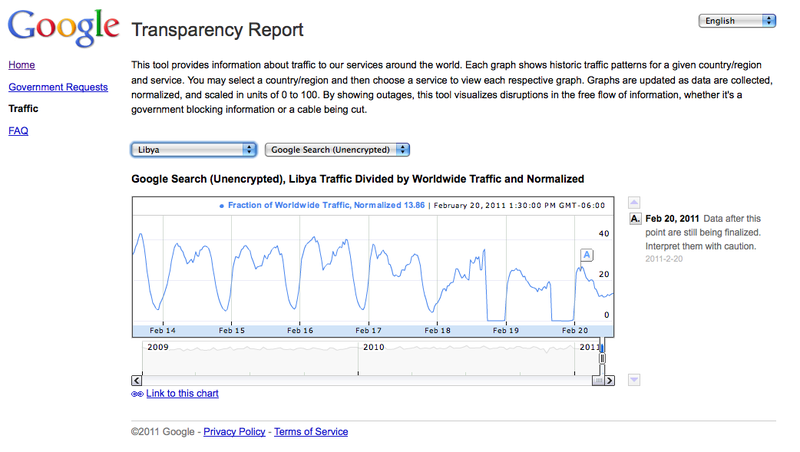 This entry was posted on February 20, 2011 at 3:15 pm and is filed under Google Transparency Report Libya. You can follow any responses to this entry through the RSS 2.0 feed. You can leave a response, or trackback from your own site.